If you’re trying to eat healthy, you might worry about adding too much dairy to your diet, since dairy products are generally considered high fat foods. But if you add the right kind of dairy to your meal plan, it doesn’t have to have a negative impact on your calorie count. 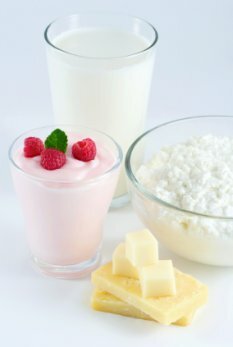 In fact, studies have shown that dairy foods may actually contribute to weight loss and a healthier body, since it provides the body with the calcium it needs. Calcium found in dairy products is far better than any other source of calcium. You can implement dairy products into your diet plan by concentrating on low-fat options, including cheese products and milk. People who increase their intake of low-fat dairy to 3-4 servings per day, as recommended by Perdue University, have seen a 28% increase in the amount of fat they burn while exercising. Most people associate calcium with strong bones. While it does contribute to a decrease in osteoporosis, it has other benefits you can enjoy, such as regulating your heartbeat. When your body is deprived of calcium, it creates a hormone known as calcitriol, which causes it to horde calcium in your fat cells, resulting in weight gain. When you’re cooking soups, try to use a milk base instead of a broth base if you’re trying to increase your dairy intake. Milk makes rice and risotto dishes creamier in texture, which is another smart way to sneak in your dairy.